One of the cutest little beach towns along the California coast, Cayucos was founded in the late 1800s, and its main street still retains a nineteenth-century look. Having escaped the incursion of tacky seashell shops and souvenir sellers, modern Cayucos emerges as a laid back place to spend a weekend, with plenty of upscale restaurants and several new or newly renovated lodgings. You can plan your Cayucos, California day trip or weekend getaway using the resources below. Why Should You Go? Will You Like Cayucos? 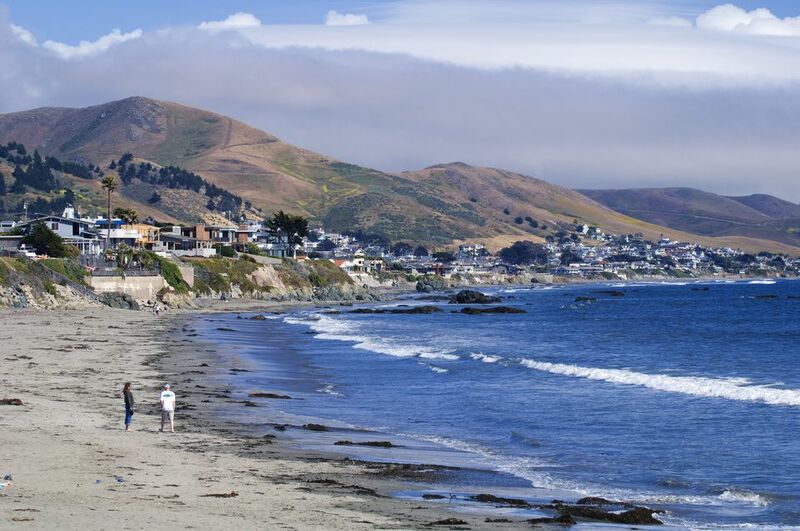 Cayucos, California is popular for quiet escapes and ocean-oriented play. It's close to Morry Bay and Hearst Castle, but is also a popular place for antique shopping, and it has some of the most modern lodging and best dining along the coast. We polled more than 400 of our readers to find out what they think about Cayucos and their opinions are split. We don't collect comments, but my best guess would be that people who give it a low rating don't think it has enough to do. The biggest attraction of Cayucos is its simplicity. Don't miss an opportunity to linger over a cup of coffee or relax on the beach. Antique Shopping: Cayucos is the best place on this section of the coast for antique shops, with a half dozen shops along Ocean Avenue. Tour the Murals: (1 hour) You'll find artwork depicting a broad range of subjects all over town. Go to the Beach: It's right in the middle of town, with a scenic pier in the middle where you can fish or watch other people trying to catch something. On summer Friday evenings, there's a fireside story-telling session near the pier. The Cayucos Pier is also the northernmost place where tiny grunion fish swarm ashore to spawn during the nighttime high tide right after full or dark moon phases in summer. Visit Hearst Castle: (4 hours or more) A half-hour drive north of Morro Bay; Hearst Castle is the area's most popular attraction. Elephant Seals: The elephant seal rookery, right on Highway One about 4.5 miles north of Hearst Castle is most interesting during the breeding season, from December through February when almost 4,000 pups are born in just a few weeks. The annual Peddler's Faire takes place over Labor Day1 weekend, and an antique car show happens every November. On January 1, hundreds of people meet at the pier for the Carline Soule' Memorial Polar Bear Dip, a sometimes-frigid first swim of the year. Most of the lodging in Cayucos is along Ocean Avenue. Cayucos Shoreline Inn is the only hotel on this part of the coast that's right on the beach. However, there's a wall at the back that blocks views from the first-floor rooms, so ask for one on the second floor. On the Beach Bed and Breakfast doesn't quite live up to its name, but it's close, just across the street from the sand. Find out what you need to know about finding a hotel in the area. Read reviews and compare prices at Tripadvisor. If you're traveling in an RV or camper - or even a tent - check these Cayucos area campgrounds. Not listed in the recommended hotels because it's too new to have a track record yet is Cayucos Sunset Inn. If the rooms and hospitality match up to the quality of the restoration work, it's a good bet. Cayucos is halfway between Los Angeles and San Francisco just 4 miles north of Morro Bay, 292 miles from Sacramento, 125 miles from Monterey and 424 miles from Las Vegas. It's located on California Highway 1, 31 miles south of Hearst Castle. If you're driving north on US 101, exit onto Highway 1 north of San Luis Obispo. Going south on US 101, exit at Highway 41 near Atascadero and take it to Highway 1, and then go north. If you take Amtrak to San Luis Obispo, you can catch the Ride-On Service that will take you right to Cayucos. 1 Labor Day is celebrated on the first Monday in September.